1 Blemished Available: $119.96 This item is available as a Blem/Refurb. These are items that cannot be sold as "New" merchandise and are limited to stock on hand. See the product details for a description of the product's condition. 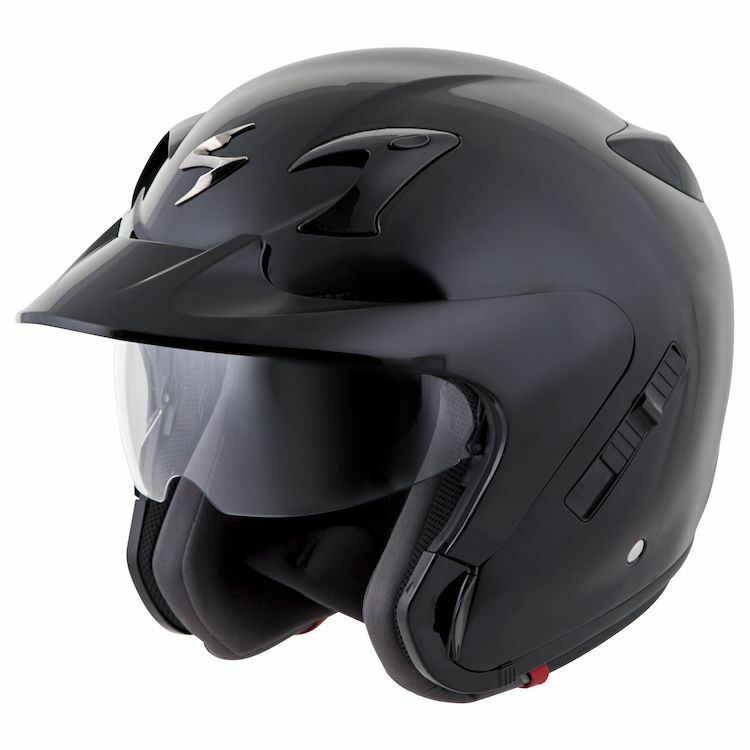 The EXO-CT220 was designed to offer a modern, protective and functional helmet for riders who need more than just an old-school open face helmet. The versatile EXO CT220 can be fitted with a sun blocking visor (included) for that wind-in-your-face feel or a full face shield (also included) for serious wind blocking. The face shield is specially extended in length and reduces turbulence inside the helmet by redirecting airflow under the helmet instead of the interior. I bought this helmet because I wanted something that offered a little more protection than the half-helmet I was wearing. I wore it 3 times, and it's been sitting on a shelf ever since. It's overly bulky, there's no eyewear channel, and it has got to be the noisiest helmet ever. The buffeting was almost unbearable, even with the vents closed. It was far from comfortable, especially with the foam pushing the frame of my glasses into the side of my head. I feel like this helmet would be great for a scooter, but not something that goes faster than 40-50 mph. Nice helmet. First time rider here and love it! Best helmet I ever had, completely love it!! Nice and comfortable. Snug fit for a large. Overall good helmet. The biggest dislike was installing the mic and head phones! There’s no room for the speakers. There in the wrong place. Took the cheek pads out and cut them down. I like this helmet a lot. Comparing with other helmets I had this is the best. Scorpion EXO vs: Shoei RJ Platinum - This NEEDS Eyewear channels ! This would be a PERFECT helmet for those of us who can't handle a full face or helmet with a closed shield, IF it had eyewear channels for glasses. There are only TWO decent manufacturers of vented helmets with peak visors and Shoei is the other. The venting and price on this helmet is GREAT, much better than the Shoei. The Scorpion runs very small compared to the Shoei, but when have to wear eyewear, the pressure on your temples is excruciating, & after a couple of hours causes headaches & leaves pressure marks for days. SCORPION: Please offer retro fit pads that have eyewear channels as most people that want a open face helmet need to wear some type of eyewear as well. Me and the wife love these helmets. We decided to jump up from half helmets to 3/4 and haven't looked back. Love these helmets. Comfortable, quiet and quite good looking as well. Multiple options to make it adjustable for different riders. Wife use the face shield and I prefer the visor peak. 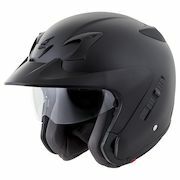 i HAVE THE SCORPION IN A 1/2 HELMET AND LOVE THE FIT AND STYLE, SOOOO I WANT TO TRY THE 3/4 FOR THE COOL RIDING SEASON. Nice reviews , need a helmet with flip down sun shade, full face clear shield and quality. Great features such as the peak visor with adjustable drop down sun visor. Will use this as an open face helmet without the face shield. Good to have that as a backup/option. Seems to best 3/4 helmet with visor under 250 dollars that will go up to a 3xl. I like the video and reviews given by revzilla. Wanting a good looking 3/4 helmet and having an interchangeable face shield when needed. Positive reviews, multiple configurations with and without visor, shield, etc. Price under $150. Looks good, light. I don't want to spend 300 dollars or more on a helmet, and there were numerous positive reviews of this helmet; it is in my price range at about $150, so I thought I would give it a try. I own a scorpion half helmet and really like it. Wanted to get another scorpion with sun visor and face shield. Reviews look good, so I thought I would try the CT220. Bang for the Buck!. Lots of handy features on a tropical climate. Good reputation. We have other scorpion helmets, has good fit and features for the price. I purchased this helmet to wear on long trips for riding in the rain. Liked the looks, the flip down internal sun shield and the fact that the face pads allow for glasses. Probably won't use the full face shield. Based on research and review. Based on the video review, I chose this helmet. I cannot wear a full face helmet due to a phobia of mine. I ride a scooter and decided to go with open face with a face shield for the best protection other than full face. The review really was the deciding . Thanks so much for making those videos. I have learned so much from them and it made my purchase easy. I wanted an all around versatile helmet, this fit the bill perfectly at a good price. Liked the look and fair price. will hold further comment until it arrives and I can try it on. Nice helmet with many features for the price. After speaking with your rep, I felt that this was the right helmet for the right price, and I felt good and confident about the knowledge of the associate. I needed a replacement for my EXO CT200. I shopped around at the Chicago motorcycle show and couldn't find a simple, clean, old school style 3/4 helmet. I always liked the fit of my old helmet, so I went back to Scorpion. I could do without the high-tech looking vents, but it should do the trick after I remove the visor. I wanted a 3/4 helmet with a visor and the sun shade - don't really care about the full faceshield, but was the closest to exactly what I wanted. Because of the in depth video review of the product, free shipping and returns if needed which is great when it comes to Helmet's. I have a full face Scorpion helmet and have been extremely happy with it. I needed a replacement for my 3/4 helmet which I use when riding around town and inner city so I was open to Scorpion. Finally after reading the reviews I felt comfortable purchasing another Scorpion helmet. Appears to have all the features that I'm looking for, at a good price point. Father likes the style, so it's a gift. My husband had a Scorpion helmet in the past, we really liked it. I chose this one because of the sturdy construction, and all the special details. The price was was very fair also! We liked the features vs. price point as well as the styling. We only wish it came in more colors like grey, silver or even gold. Black and matte black are not much of a choice! I'll post a review when they arrive. I chose this because I was looking for an long or intermediate oval fit in a 3/4 helmet. This is about the only one there is. I have just switched over from sport bikes and am looking for a good 3/4 with shield. Is this one quiet? I don't have a windscreen to dampen noise. I have a full face but its design is for the 3/4 or tuck position and i feel like a bobble head just cruising. BEST ANSWER: I ride with a EXO-110 half helmet and this EXO-CT220 3/4 helmet when cruising on my Yamaha Raider "S" cruiser. Since I do not own a car the 3/4 helmet is for colder weather and the 1/2 helmet for Florida summertime weather. I love my Scorpion. Having a helmet with a removable shield and replace it with a visor nakes me good with the shield when I want to use my iSena 20s for communication, or pop it off for the freedom of having the wind in my face. Plus I like to drop the built in sun visor when needed. Lastly, I find the fit better than my Neotech. You won't regret it. Enjoy the road! With the Vents closed this is a very quite helmet. With then open, different story. I have a windshield, but I do find this helmet to be quite. How do you remove the drop down sun visor on the Scorpio EXO-CT220? BEST ANSWER: It says it's possible, and you can buy yellow and clear ones to replace. But I have yet to find anywhere online that tells you how. I have the helmet and love it, I would just like to be able to swap it out for night riding. I have never tried to remove the visor. It does retract into the helmet with a slide lever. You can choose to have it up and not in use or down to use. The distance it comes down is also adjustable. You push the visor up over the helmet, like you would the face shield. Once up, the release lever is exposed at the temple area of the helmet. Push the lever and it will release the visor. Not the face shield, the internal sun visor. What is the weight of the CT-220 helmet? BEST ANSWER: According to my scale, approximately 3lbs. w/o clear face shield attached. Size large is a comfortable 3.1 lbs. Fairly light for this type of helmet. Not satisfied with the amount of wind noise. Drives mr crazy. I don't have any idea, but it is considerably lighter than my modular helmet. One of the pics shows a clear visor, vid shows tinted, and description says sun visor. Does it come with clear and tinted? BEST ANSWER: The clear visor is on the outside. It flips up and locks down. I use it all the time! The tinted visor is inside and flips up and down with a switch on the side. I use this one alot, too. It's a very versatile helmet! Would you say that this helmet runs tight or loose? Can I trust the manufacturer's size chart? Let's say my head circumference is 23 3/8", would the Large fit nice on me? BEST ANSWER: I dont know about # sizes but I feel these are true to size. I also have a modular Shoei XXL. This Helmet fits much better. The fit seemed to match the chart. Unfortunately in my case it was more of a round fit and made a hot-spot on my forehead so I sent it back. Revzilla was really great about returns though, so it was no problem. I'm just over 23 inches in sircumfrance what size do I need? BEST ANSWER: I'm 23.5 around my head and I wear the XL. I find it very comfortable. I wear perscription glasses, could the flip down inner visor still be used? BEST ANSWER: The answer to your question is yes. I also wear prescription glasses and use the flip down visor frequently. I also have to say of all the helmets I've bought over the years ( I'm 65 ) this is the most comfortable helmet I've ever owned. I have a 'pin head' in that i measure 34 cm which is XS. When I tried on Shark helmets XS was too small, and a S fit nicely. I'm having this brought to me overseas, so I can't return it. People are saying it fits 'true'. So which would you go for? I have an oval shaped head. I wear a large and would say that they fit true to size. I found it runs very small. Does the Scorpion EXO-CT220 fit like the old Scorpion EXO? I wear an XL. BEST ANSWER: I didn't own the previous Scorpion EXO so I can't say. I will say that it seems to be a very good fit and true to other XL sized helmets I own. Not sure what you mean by "old Scorpion EXO", but I have the EXO-500 and CT-220 both in a large. How easy is it to remove shield? BEST ANSWER: I can remove mine in less than 60 seconds and it's just as easy to install a replacement. Having multiple types is a good idea. Clear, Smoke and Amber are my preferences. Shield is easily removed and replaced. The Scorpion EXO-CT220 is the best 3/4 helmet I could and I searched and tried on at least a dozen others over several months.